Mrs. S | Pump That Pedal - We've got it, You want it, Come and get it. 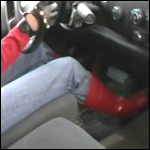 This is the second clip from the stuck adventures of D-man and Mrs. S. This time, she’s wearing a pair of shiny red boots over some jeans and a pair of sporty black leather driving gloves. Lots of flooring trying to rock this big Chevy truck out of it’s muddy…. D-man rented a Chevy truck for Mrs. S to play in some mud with. Dressed in a new pair of boots, jeans and red top, D-man enjoys a good show of pedal pumping, wheel spinning and mud flinging from this lovely lady. 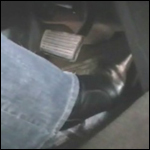 She puts the gas close to the floor….